PASSION AND CLASSIC RACERS. 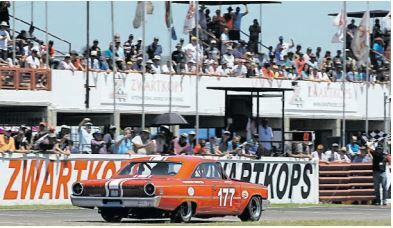 Saturday’s races for SKF Pre-1966 Legend Saloon Cars should have a capacity Zwartkops crowd on its feet. The event will boast more than 300 entries, representing 14 racing categories. As has become tradition, this Saturday’s annual international Passion for Speed extravaganza at the Zwartkops Raceway will kick off the 2019 South African circuit racing season. The event, to be held for the 18th consecutive year, will boast more than 300 entries, representing 14 separate racing categories on four and two wheels. The biggest crowd drawcard should be Saturday’s two races for SKF Pre-1966 Legend Saloon Cars, where some of South Africa’s top drivers will take on a visiting team of Dutch contenders in classic V8-powered vehicles. Topping the entry list will be locals Sarel van der Merwe (Ford Galaxie), Michael Stephen (Plymouth Barracuda), Hennie Groenewald (Mercury Comet), Lee Thompson (Ford Galaxie), Jeffrey Kruger (Chev Chevelle), Jonathan du Toit (Chev Nova), Peter Lindenberg (Shelby Mustang), Mark du Toit (Ford Fairlane), Paige Lindenberg (Ford Fairlane) and Oliver Broome (Ford Mustang). Representing the Netherlands will be Armand Adriaans (Chev Biscayne), Frans van Maarshalkerwaart (Plymouth Fury) and Herman van Putten (Studebaker Golden Hawk). Saturday’s quickest lap times should be set during the races for Auto Truck & Tyres Pre-1974 International Sports Racing Prototypes. Heading up the sports car field should be drivers like Larry Wilford (Lola T70), Peter van der Spuy (Porsche RSR Turbo), Neil Lobb (Lola T70), Keegan Campos (Porsche 911 RSR), Jan Kling (Ford GT40), Willie Hepburn (Chev Camaro), Brian Algar (Porsche 911 RSR), Fred Konig (Porsche 911 RSR), Jonathan du Toit (Chevron B8), AndreBezuidenhout (Porsche RSR Turbo), James Dallais (Ford GT40) and Lee Thompson (Ecosse). The races for SKF Pre-1966 Under Two-litre Saloon Cars will see drivers like Trevor Tuck (Alfa Romeo Giulia), Vic Campher (Volvo 122S), Rob Gearing (BMW 2000 Ti), Chad ten Doeschate (Alfa Romeo Junior), Alan Poulter (Volvo 122S), Ben van der Westhuizen (Lotus Cortina), Marc Miller (Alfa Romeo Giulia), Carel Pienaar (Lotus Cortina) and Francesco Lombardi (Alfa Romeo Sprint) fighting for the podium places. A large variety of cars will tackle the races for SKF Pre-1966 Little Giants, with Ishmael Baloyi (GSM Dart), Josh Dovey (Austin Healy Sprite), Chris Carlisle-Kitz (Ford Anglia), Jaco Taylor Alfa GT Sprint), Lian Murphy (Volvo P1800), Dion Valentine (Mini Cooper), Jaco Taylor (Alfa GT Sprint), Keith van Heerden (Jaguar D-Type), Greg Moloney (GSM Dart) and Stephen Britz (MGB) among the victory favourites. Bringing an exciting modern slant to proceedings will be two races for G&H Transport Extreme Supercars, where 31 exotic vehicles will take to the tarmac. Charl Arangies (Aston Martin Vantage V12) should be the man to beat, with his closest adversaries people like Franco Scribante (Porsche 997 Turbo), Jonathan du Toit (Ferrari F430), Ricky Giannoccaro (Lamborghini Gallardo), Dino Scribante (Porsche 997T), Mark du Toit (Ferrari F430), Deon du Plessis (KTM X-Bow), Franco di Matteo (Alfa GT3), Dawie Olivier (BMW M3 Turbo) and Ben Morgenrood (Toyota Lexus). Single seater enthusiasts will not be left out in the cold – there will be two races for Historic Single Seaters, 1950 to 1970. Drivers to watch must include Chris Clarke (Titan Formula Ford), Paul Richardson (Dulon FF), Blane de Meillon (S&J Mk8 F), plus British visitors Alan Baillie (Brabham BT14), Richard Wilson (Lotus 27) and Richard Smeeton (Formula Junior). DAF Trucks will have seven XF105 models out, twice during the day at 10.20am and 11.35am, where 14 lucky people will be able to go around the circuit in these 8 900kg, 375kW, 2 300Nm vehicles. Watch the DAF and Zwartkops social media platforms to stand a chance to win a seat.